The ubiquitous use of smartphones in today’s society today has resulted in the creation of numerous apps that helps everyone to gain access to a greater wealth of information and increase productivity. 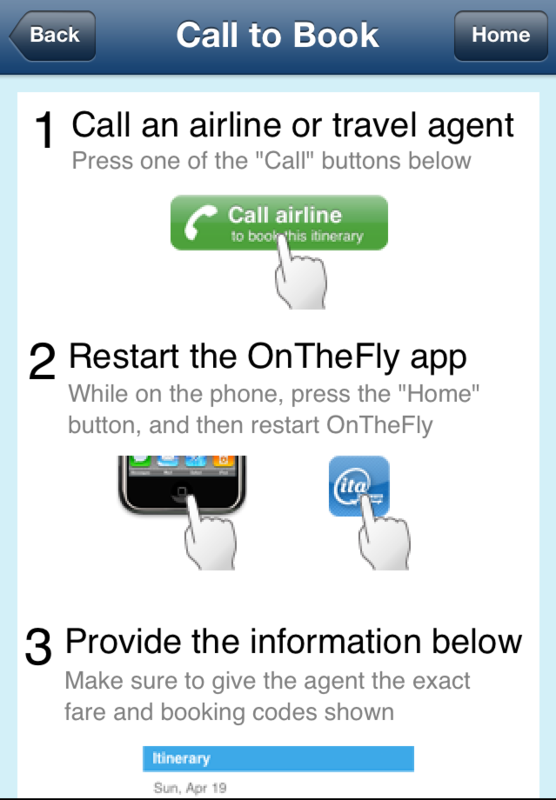 And one travel app that I really like a lot is the ITA Matrix app also known as OnTheFly by ITA Software. 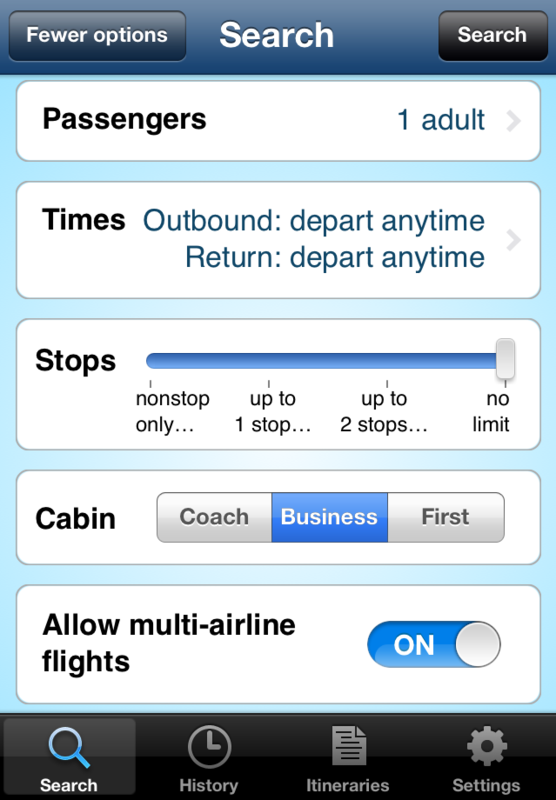 Many people would probably rely on travel agents or ticketing portals like Priceline and Expedia for buying tickets but with this app, it provides a lot more flexibility and information especially for long distance and complicated routes. 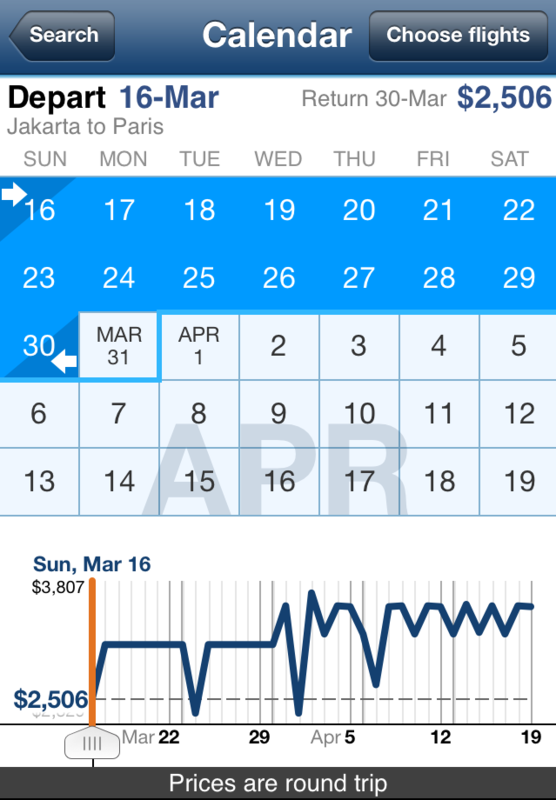 This is also the app to use to check and compare airfares as it includes results that come directly from airlines themselves. After all many airlines now have consolidator fares that less experienced travel agents would not be able to obtain. With the few steps outlined below, I shall show how simple it is to actually discover the multitude of options when seeking to travel. These screenshots from my iPhone also showcases some of the nifty features of the app and why this is a must for those who fly frequently! The next step obviously is choosing when to travel. 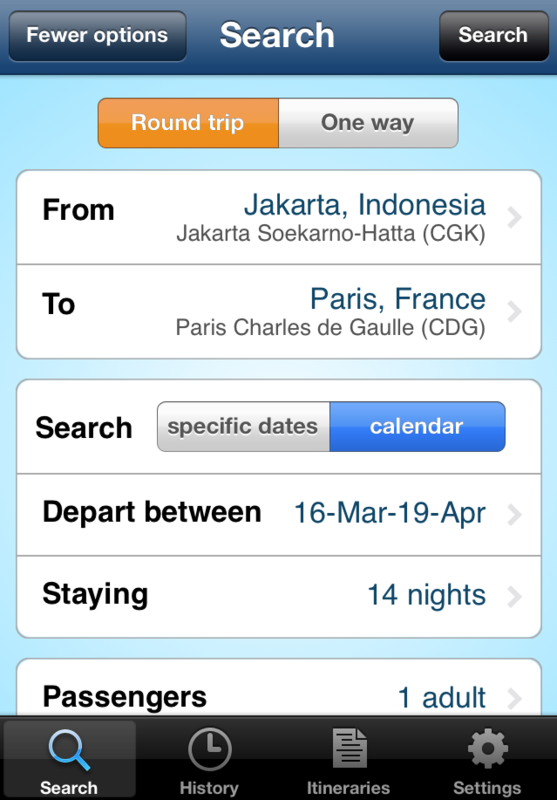 Unlike many ticketing agencies, the app provides very good flexibility in choosing departure and return dates. One can simply set a fixed date and choose from the options or if you are looking for the cheapest price, choose a calendar option and a range of dates within a one month period. This works very well if you are planning to do travelling in the next one year or so when you can pre-book your leave. 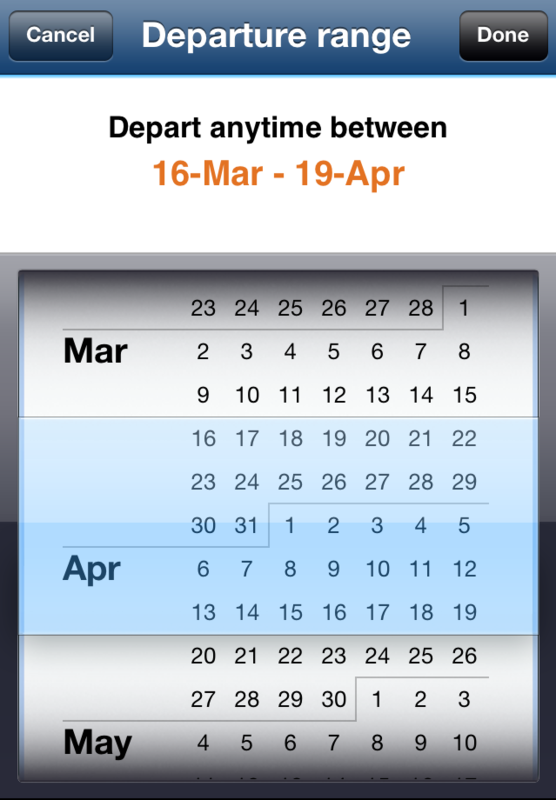 Instead of asking you for your return dates, the app asks you for how long do you intend to stay in your destination. It can range from 1 day to even 1 year, so that is a lot of options when booking flights! Sometimes travellers have very specific options when it comes to flying like the times of departure, the maximum number of stops or even the classes they seek to travel in. 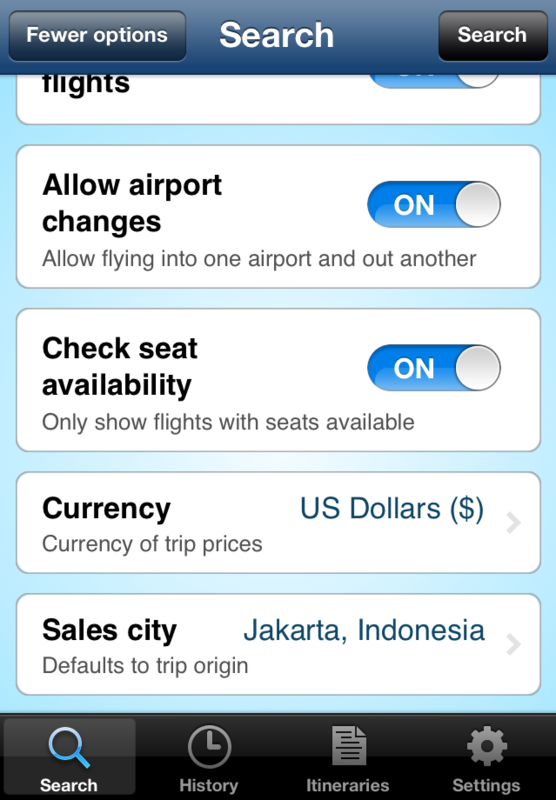 Users can also choose to disable the multi-carrier flights option. Other useful options to take note are the ‘Allow Airport Changes’ options as some major cities like New York (LGA, EWR, JFK), Tokyo (NRT and HND) and Shanghai (PVG and SHA) have more than one airport and they can be very far from each other. 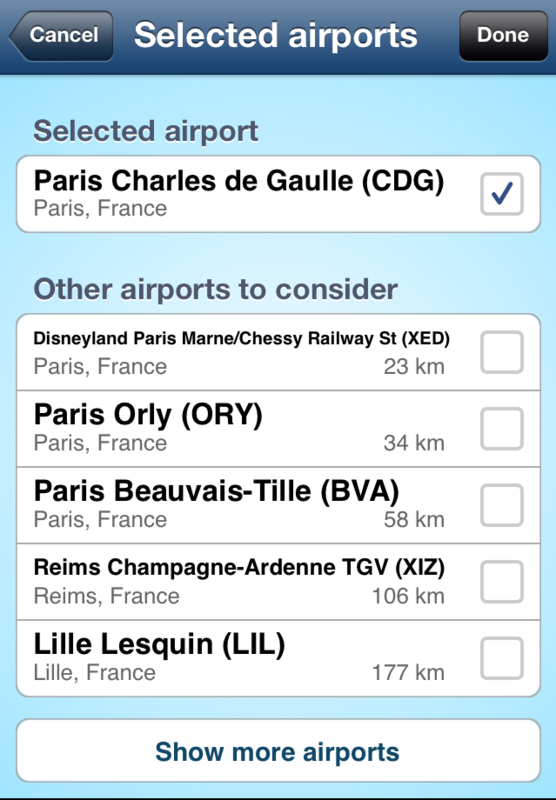 Disabling this option is best for novice travellers or those who are not familiar with the city. Another feature to take not is the currency where prices will be quoted at. Usually, the airfare is priced at the currency of the country where you depart from. However in this case, I have decided to set the airfare in US$. Once users press on the ‘Search’ button, the results will be shown. In this example I searched for ticket prices between Singapore and Vancouver, departing anytime between 10 Nov to 14 Dec with a stay duration of one month. 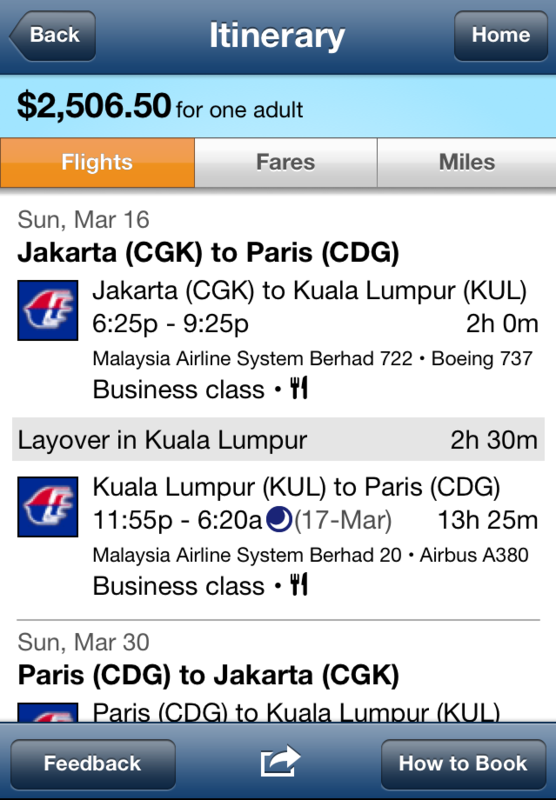 In addition, I chose ‘Business Class’ flights with no other limitations. Since I picked the ‘Search by Calendar’ option, I get the matrix results shown below. This is one of the nifty features of this app, as it can be used to identify some good deals for certain periods of time. 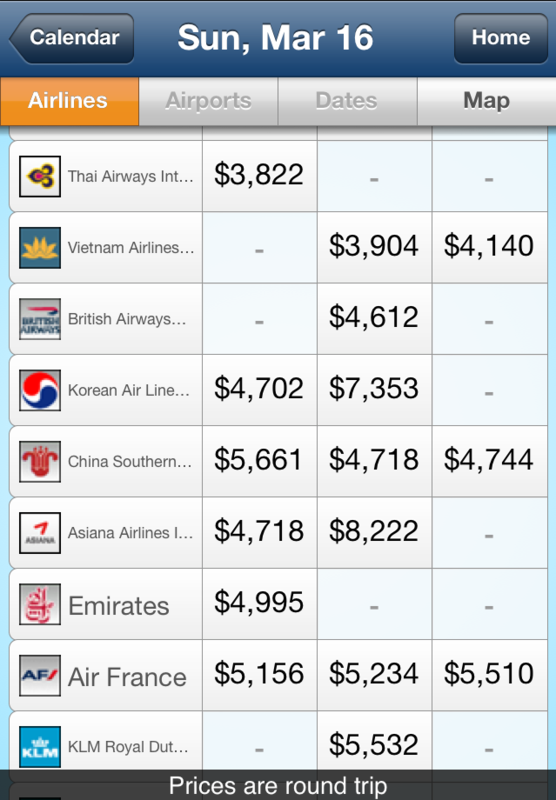 For travellers with a flexible travel schedule this app can save them some money as the screenshot shows below since Business class fares can vary by up to S$1,000 over one or two days of difference. Once a departure date is chosen, the available flights and routes are shown in a tabular manner. 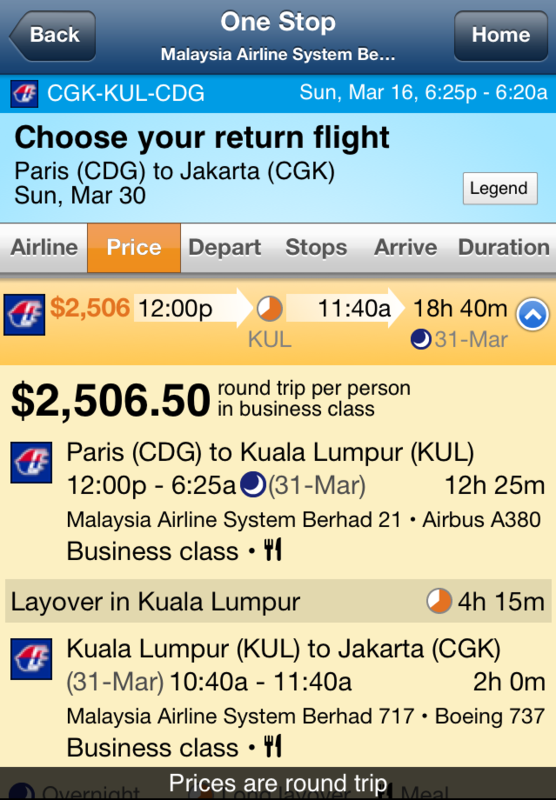 Just looking at these fares, Malaysia Airlines obviously offers the cheapest Business Class fares for departures from Jakarta to Paris. The gulf carriers come next with business class fares around US$3,800. Given these choices, I would definitely say the deal on Malaysia Airlines is superb especially since I know the KUL-CDG sector will be on their new Airbus A380 with full flat seats. The next best choice would perhaps be on Etihad that comes with staggered business class seats on the Boeing 777. One thing to note when choosing the airlines is that some code-share flights are not reflected well. 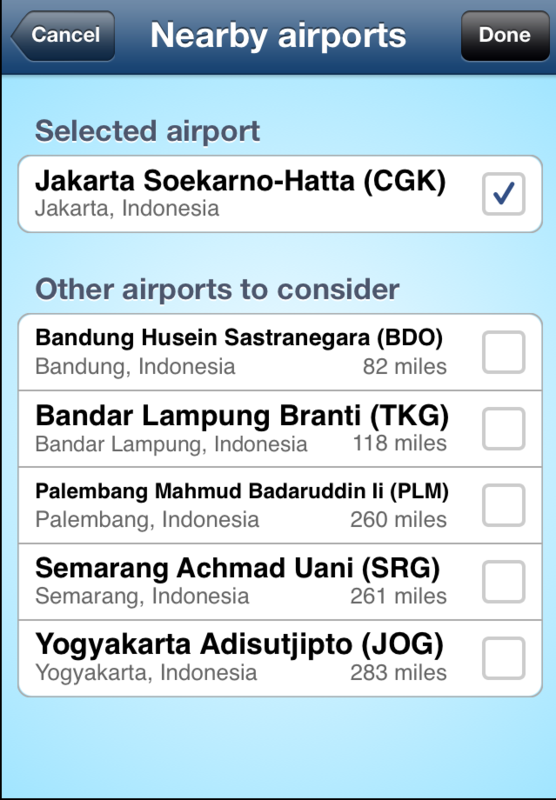 Only by clicking on the flights itself will users know what airline will bring them there. Some of the best deals can usually be found under the ‘Multiple Airlines’ section where consolidator fares are likely to be shown. 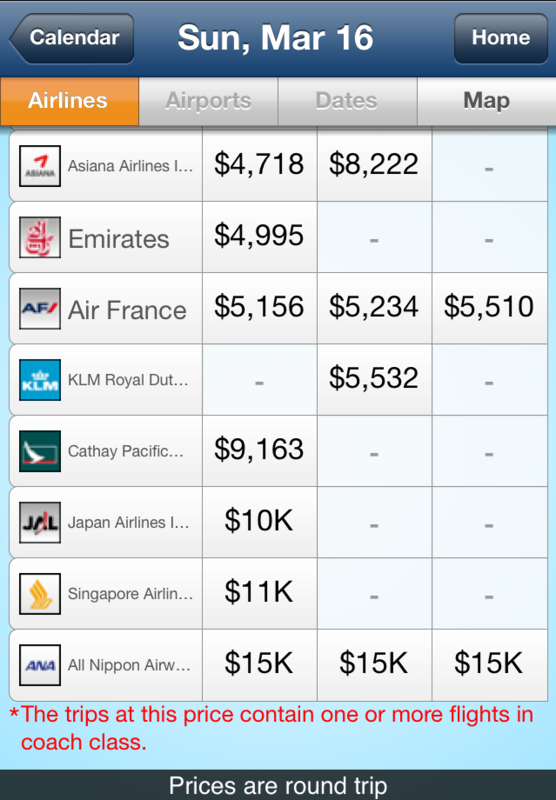 However from the ITA app, it is not difficult to see which airlines are truly the premium ones. Indeed Cathay Pacific and Singapore Airlines are asking for a lot in Business Class with prices hovering around US$9k to 11k. Another thing to take note is the little red disclaimer at the bottom of the search table since flights marked red means it is not flown on the class of cabin that was requested. Sometimes when searching for Business class fares, First class fares can appear and there are even times it is cheaper than Business. 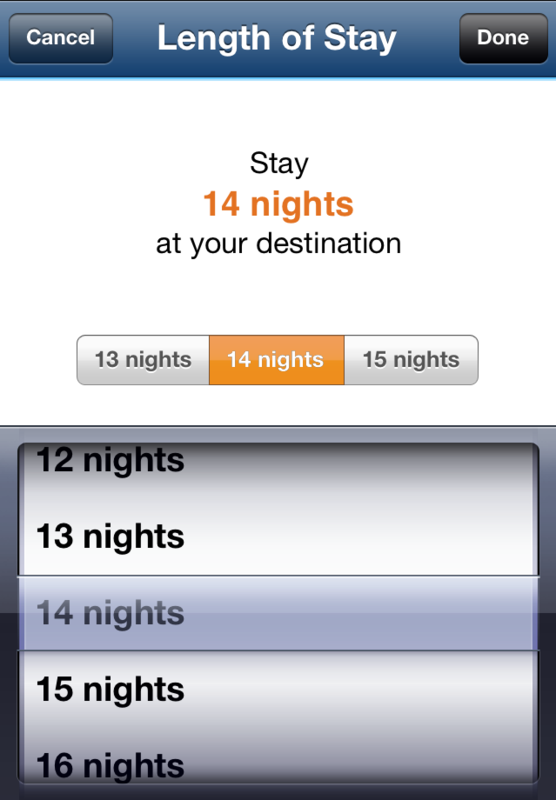 This is where the app provides some opportunity for travellers to get good deals on premium class of travel. After a choice of which pricing and airline combination works best, the next step involves choosing the best time of departure. 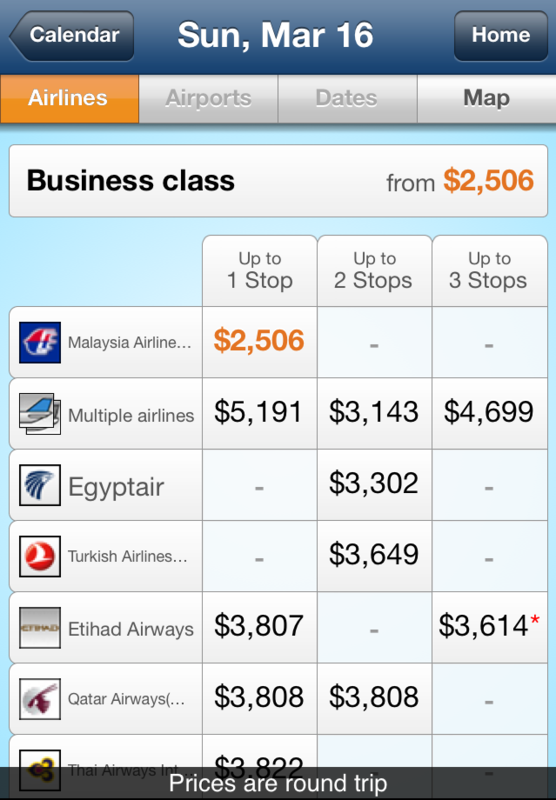 As mentioned earlier, I would definitely pick Malaysia Airlines since I can also earn mileage as a ‘oneworld’ flyer. The second option I would have chosen is perhaps Thai Airways since they also use the A380 from Bangkok to Paris and their Royal Silk Lounge at Bangkok is amazing with free massages. In addition the Jakarta to Bangkok segment is also flown on a widebody Boeing 777 as opposed to Malaysia Airlines operating a small Boeing 737 between Jakarta and Kuala Lumpur. After you have picked Malaysia Airlines as the carrier, you still get to pick the most convenient departure times. The pie diagram above the airport code for Kuala Lumpur (KUL) actually indicates the layover or stopover duration. A long layover in excess of around 3-4 hours will be shown in orange like the first 3 options above. While an extremely dangerous short connection is shown in red in the case of the last choice. 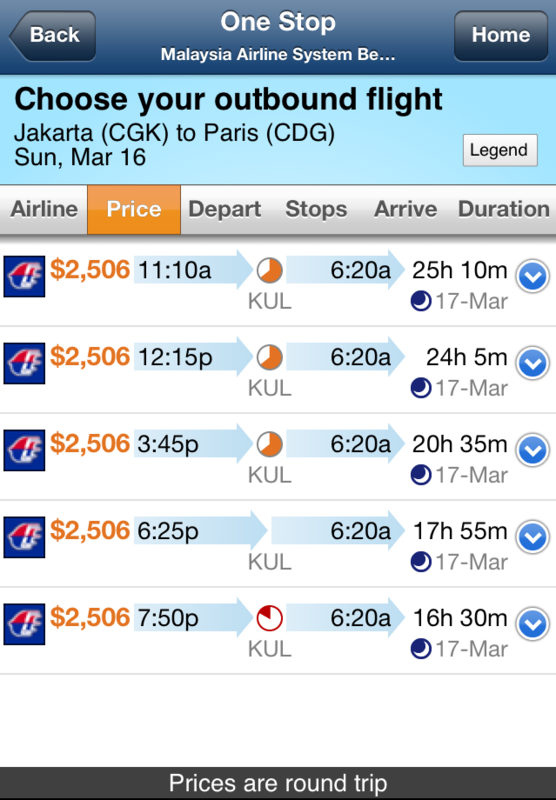 The best connection is then the 4th choice with MH722 departing Jakarta at 6:25pm, arriving in KUL at 9:25pm. After a 2 hour and 30 minute layover, the next flight departs at 11:55pm reaching CDG at 6:20am. For the return trip, there are similar choices with short layover time but for clarity, I would choose a particular flight with a longer layover. In this case the return trip will show a layover time of 4 hours and 15 minutes which results in an orange pie appearing. The last step involves booking the flights itself and once users have chosen the departure and return flights, they will proceed to a page that provides details on how to book the tickets. Instead of allowing you to book these tickets directly, the app provides the fare breakdown and the fare codes as shown in the screenshots below. This is perhaps another feature I appreciate as you can then use the fare code to determine how much miles you could potentially earn under other airlines’ frequent flyer memberships. 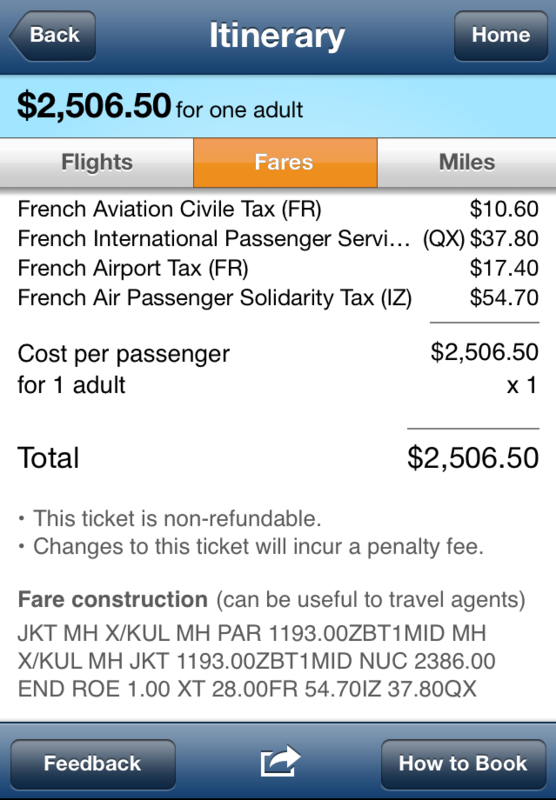 It also shows the additional taxes and fees associated with the fare. 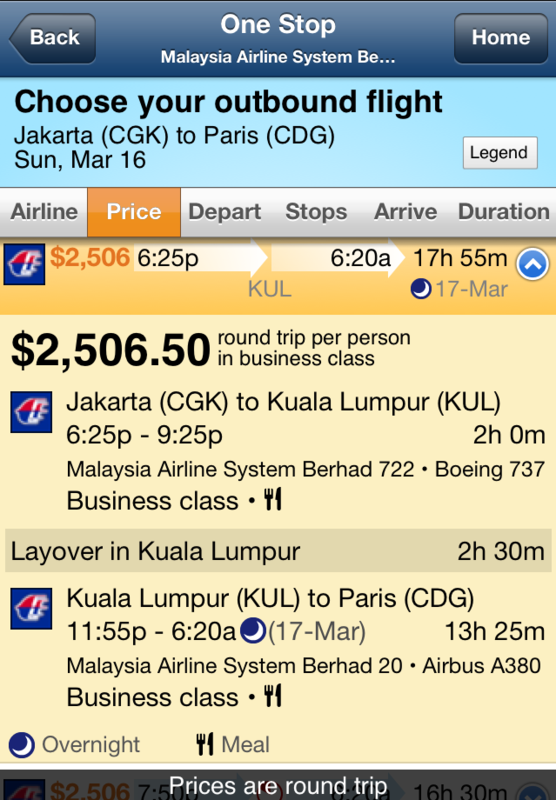 Though the final price inclusive of taxes comes down to US$2,507 which I think is a good deal for a return flight in Business Class between Jakarta and Paris. In this case the booking code is ‘Z’ which is eligible to earn 125% of the miles flown when credited to Asia Miles (Cathay Pacific’s frequent flyer). Generally once you can search for this fare, you can easily replicate it using an online travel agent or head down to your neighbourhood travel agent and show them the fare code for the flights. 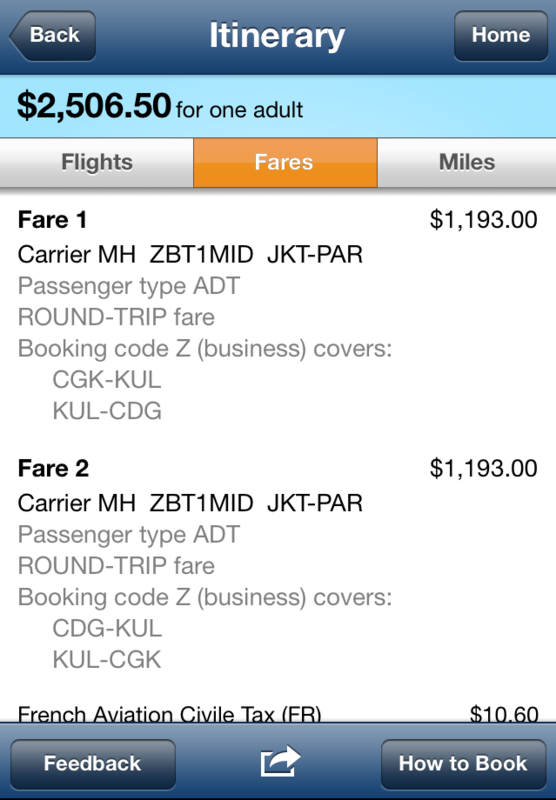 Alternatively, these fares should also be available on the respective airlines’ websites. From the app, just click on the ‘How to Book’ button on the lower right corner and you will be directed to this information. 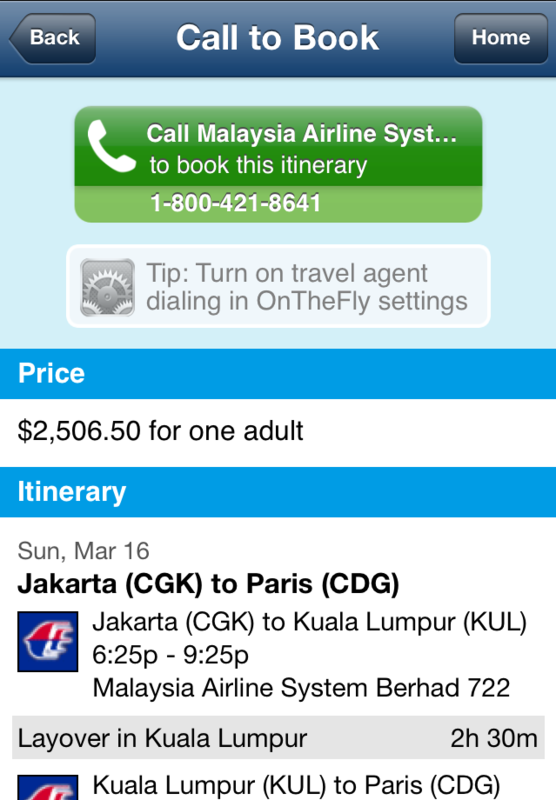 It even provides the toll-free number for Malaysia Airlines. As you can see, this app takes probably about 15 minutes to search the best possible flights that suits an individual traveller’s needs. If I had to say one drawback, it is probably on how it is difficult to book a multi-city itinerary using this app and how it is not yet updated for iOS7, though Android users should find this useful since it is developed by Google. All things considered though, I find this app the most useful to search for long-haul flights as many low cost carriers flying regional routes do not load their fares on ITA and thus might not be easily searchable. And with that, everyone could be their own travel agent with the smartphone!